In a working meeting with 28 international agents who represent 52 countries, the companies associated to the Cluster of Advanced Manufacturing of the Metal Industry were presented for the very first time in Asturias with a single voice to show to the world the capabilities of the sector to develop integral solutions in business areas of Renewable Energy Generation and Petrochemical Industry. 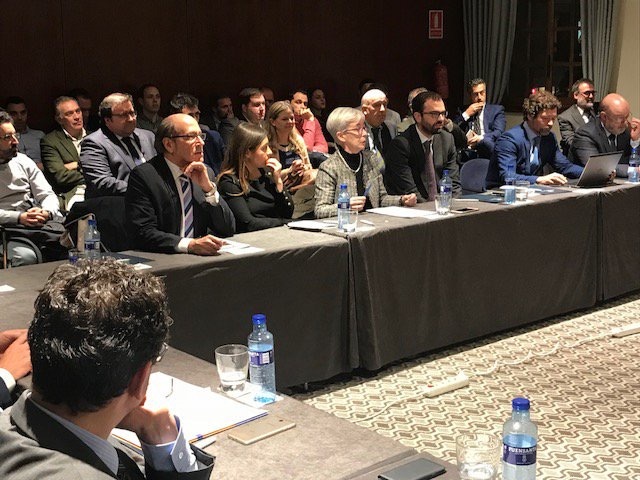 Last November, following the results of the study “Positioning of the Metal Industry in Global Value Chains”, MetaIndustry4 and Asturex constituted two working groups focused on business development in the field of Renewables and Oil&Gas topics. These groups brought together more than twenty partner companies of MetaIndustry4 which have recognized presence and specialization in these value chains such as: Asturfeito, Dinamet Ingeniería, Fundyser, Grupo Daorje, Grupo HMF, Grupo Navec, Grupo SEM, Hiasa Gonvarri, Indasa, Imetal, Isastur, Iturcemi, Mecsa, Mefasa, Metálicas Somonte, Oxiplant, TSK, Tuinsa Norte and Windar Renovables. The main objective of this team was strengthening knowledge among companies, identify their complementarities and, finally, be able to develop more competitive collaborative business opportunities. To reach these goals, MetaIndustry4 and Asturex have introduced for first time some disruptive and innovative dynamics based on Lego Serious Game in the sector. This have favored to promotion the collaborative work and the generation of partnerships. We must emphasize the involvement, dedication and commitment of each of the companies and participants without which this project would not have been possible. The proposal has had enormous interest from the Cluster’s members, from raw material suppliers, transformation companies and manufacturers of capital goods and engineering, without forgetting transversal companies in this Chains, which have added value to the final result through the integration of technology, specialized logistics, as well as other advanced services and innovation, provided by partner companies such as: Cogitrans, Encaja Embalajes, Intermark IT, Izertis, Khisgroup, Talento Corporativo and Seresco. The presentation generated high interest rates from the international promoters of Asturex who had a good number of questions to the spokespersons of the groups in order to know the fit of these proposals in their countries of origin and requesting individual meetings to address the introduction of the Cluster in their markets. After the presentation to the representatives of Asturex, MetaIndustry4 doesn´t stop, and in the near future will present new instruments and initiatives to promote internationalization through the segmentation of markets by chains, such as the development of a specific catalog of solutions by Chain of Value, as well as the presence in international fairs among other proposals.